We would like to introduce ourselves as a leading distributor of Paper, Veneering, Indwool Blanket, Textiles, Bulk Fibre, Cerablankets, Z-Blok Modules, Moist Felt,Blok607-800*C, AZS Board 1400*C, Ceraboard115-1400*C, Boards & Shapes, Veneering Cement, Mastic, Burnor Tubes, HICAST Super, CA 60, CIV 101, Cumilag 23, 26, 29 Insulating Bricks, Cumicrete Super, Grinding Media, Maithan HFK, Sharad HFK, HF & CF Insulation Bricks, Firecrete Super, Whytheat K, Insulyte 7, Shetty Make Thermotax, INS 135 Bricks & Block, Porbandar Make Firetex, IS 6, IS 8, 60%, 70% AL. & Megnasite Bricks, Monoset 50, Monocrete Super, Monolyte, Acoset 50 etc. 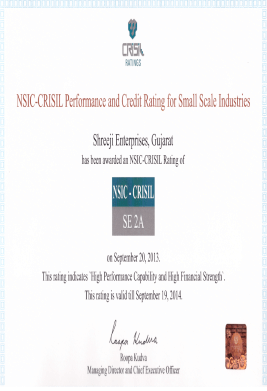 Shreeji Enterprises is committed to quality work and confident to meet the challenging demands of customers. Our Products are manufactured in different size and shapes.Our products are manufactured to meet the highest international quality and requirements. Shreeji Enterprises has Technically qualified and well-experienced persons head all the sections of manufacturing. Experienced supervisors and skilled technicians/operators are at their disposal. They ensure every manufacturing operation is carried out as per latest Quality System Management.